Callen Daquiaog is a hero and teacher among heroes. However, being the humble man that he is, he would never admit it. On October 1, 2017, he was one of the many that responded to the Route 91 shooting. He made life-saving decisions in the face of danger. At the time, no one knew when the shooting would stop, where the shooters were, or the reason they were targeting the music festival. Conflicting reports about the origin of the shots meant no scene was safe. When Callen responded to the East side of the venue, he came to Duke Ellington Way and faced the carnage head-on. 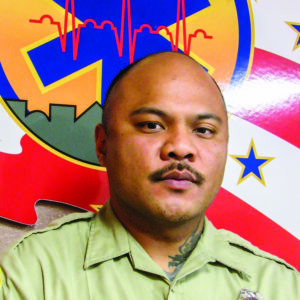 He assisted two off duty EMTs, themselves shot, to load victims into his unit. He made the decision, with a full ambulance, to head to the trauma center. His military upbringing told him this was an extremely dangerous situation, but he stayed calm and treated the critical patients in his ambulance. He dropped them off quickly, hoping he would see the two EMTs again. Callen returned to his ambulance, and once again headed toward the concert venue. He was sent to the command post where they staged for some time before reporting to a nearby smaller hospital where busloads of patients were being taken. He helped the ER triage and re-prioritize transfers out, taking six victims to an outlying hospital. Callen’s judgement was credited by physicians and nurses, who confirmed that his decisions saved many lives. In his almost four years at MedicWest, he is known as “the calm” amidst the chaos. He can always be counted on to help, whether by responding to an event like Route 91 or teaching a new EMT. Callen was honored for valor by the agency that employs the two wounded EMTs. He designed a patch for the event, and donated the proceeds to the victims fund. Callen Daquiaog is a true hero.